Pride Night Kingston Frontenacs Hockey Game Coming Soon! The Kingston Frontenacs unveiled a special theme jersey, to be worn at their home game at Rogers K-Rock Centre on Friday, January 26, 2018 when they meet the Oshawa Generals, that will help raise funds and awareness for Kingston Pride Inc and the Reelout Arts Project Inc. 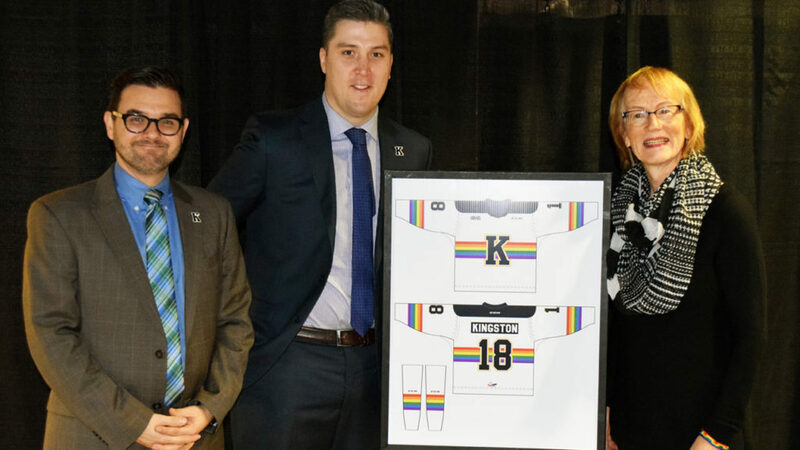 The team also announced the first Pride Night with the Kingston Frontenacs, a collaboration between the hockey team, Reelout Arts Project Inc., and Pride Kingston Inc., to support initiatives that foster openness and diversity. “Hockey fans are hockey fans, and we want to ensure that our games are a place where our fans are free and safe to cheer regardless of gender identity or sexual orientation,” said Justin Chenier, Executive Director of Business Operations with the Kingston Frontenacs. 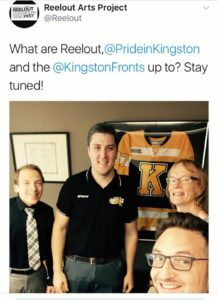 “I am proud of the Kingston Frontenacs for recognizing that there is no place for homo/transphobia in the arena of athletics and that our local heroes champion respect, recognizing that love is indeed love,” said Matt Salton, Executive Director of Reelout. Kingston Pride Inc. is a not for profit organization which brings together under one umbrella the wide diversity of people of varying sexual orientations and gender identities. Their mission is to perpetuate the spirit of pride in our community’s identity throughout the year, culminating with an annual Pride Festival. Reelout exists to celebrate queer media arts and to contribute to community vitality by programming materials that focus on issues of sexuality, race, culture, religion, class, gender, ability, health, and age, thereby purposefully drawing together and initiating challenging dialogue among disparate members of the queer communities in Kingston and the surrounding area as well as between the larger Kingston community and the queer community. The special Kingston Frontenacs Pride Jerseys will be auctioned off and the net proceeds will be donated to Pride Kingston. More details on the auction will be released closer to the game.